FOCUSING ON THE DEVELOPMENT OF HOCKEY SKILLS AND PERSONAL GROWTH THROUGH EDUCATION, ACCOUNTABILITY, TEAMWORK AND RESPECT FOR THE ORGANZATION, COMMUNITY AND ALL PARTICIPANTS IN THE GAME OF HOCKEY. The SWIFT CURRENT DIAMOND ENERGY WILDCATS are a female AAA midget hockey program for Saskatchewan female hockey players aged fifteen through seventeen located in Swift Current, Saskatchewan. The WILDCATS are proud members of the Saskatchewan Female AAA Hockey League (SFMAAAHL) along with the following teams: Battleford Sharks, Melville Prairie Fire, Notre Dame Hounds, Prince Albert Bears, Regina Rebels, Saskatoon Stars and Weyburn Gold Wings. The WILDCATS practice Tuesday, Wednesday and Thursday between 4:15pm - 5:30pm each week at Fairview West Arena in Swift Current, Saskatchewan. The WILDCATS play twenty-eight regular season games each year. They will play between ten and twenty exhibition games as well as playoffs for a schedule that totals between forty-five and fifty-five games. The WILDCATS take part in weekly fitness sessions which include gym workouts, team runs, jazzercise and fitness stations. Video sessions have also become a part of the WILDCAT program. WILDCAT players are active in the community as they volunteer annually at the Mercator Financial Community Festival, Swift Current Wheelchair Hockey, Swift Current Bronco games, the Family Resource Winter Carnival and with minor hockey. The WILDCATS and the SFMAAAHL are entering their eleventh year in existence. 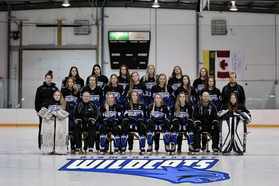 The WILDCATS have proven to be one of the elite female AAA hockey programs in Saskatchewan and western Canada. The WILDCATS play one of the toughest female midget AAA schedules in western Canada on an annual basis. The WILDCATS have reached the provincial final four times and also captured back to back titles (2007 & 2008) at the prestigious MAC'S AAA MIDGET TOURNAMENT held annually in Calgary, Alberta. The WILDCATS have an overall regular season record of 149wins, 118 losses, 13 ties. Their overall playoff record consists of 40 wins and 35 losses. The WILDCATS also play a number of exhibition games and tournaments throughout the year and have previously made trips to Wilcox, SK for the Mandi Schwatrz Memorial Tournament, Calgary, Alberta for the MAC'S AAA MIDGET TOURNAMENT, and Faribault, MN to play the highly rated Shattuck St. Mary's Prep School. The WILDCATS travel to Hartney, Manitoba each year to attend the Westman Wildcats Spring Classic as well as attending the Central Plains Showcase in Portage la Prairie, Manitoba in late September. The WILDCATS visit the Banff Hockey Academy Bears each season in September. The WILDCATS had the privilege of hosting the Czech Republic U18 World Junior Team in January 2008. The WILDCATS are very proud of their alumni as fifty-two former players have advanced to play college/university hockey in Canada and the United States. The WILDCATS also have had four former players suit up in the Alberta Female Junior Hockey League.